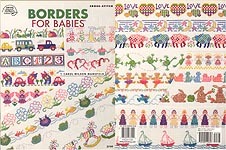 Borders For Babies, designed by Carol Wilson Mansfield, American School of Needlework, 2004. Designs in Counted Cross-Stitch include: Angels, Garden Angels, Snail, Bugs in Grass, Smiley Flowers, Rocking Animals, Cats, Dogs, Hearts, Love Hearts, Paper Dolls, Stars and Moon, Cupcakes, Leaning Houses, Ballerina Bears, Cars & Trucks, Sailboats, Airplanes, Blocks, Frogs, Sheep, Cats & Fish, and Rabbits. Brand NEW! However, may smell slightly of cigarette smoke. 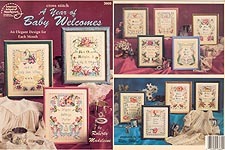 A Year of Baby Welcomes, designed by Roberta Madelein, American School of Needlework, 1996. A design for each month, based on the flower of the month. Brand NEW! It's A Baby Teddy, designed by Dale Burdett, Jeanette Crews Designs, Inc., 2000. 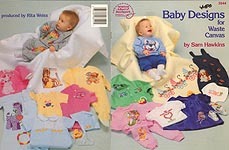 Designs include: Birth Sampler Insert, Baby Teddy Bear w/ Balloons, Small Flying Bears, Falling Baby Bear with Bird, Babby Teddy on Cloud with baby blocks, Baby Bear with Star Wand, Baby Bear With Butterflies, Baby Girl Bear with Teddy Doll, Baby Teddy on Rocking Horse w/ alphabet, Baby Birdhouse with Bears of a Feather, Baby Teddy with Birdies, Baby Teddy with Birdie and Heart Balloon, baby Girl Teddy with Birdies - Blocks - Ball, Baby Girl Teddy with Birdie and Heart Balloon, Baby Booties (Stick Horses, Small Toy Trains, Roses, Butterflies, Star Balloons, Giraffes, Chick Pull Toy, Heart Balloons, Baby Rattles, Gingham Heart with Baby Beads), Velour Baby Bibs with Rainbow Border (Blue Baby Elephant, Large Train with Star Balloon, Baby Teddy Faling, Baby Girl Bear with Teddy Doll, Bee My Baby), Gingham Infant Bibs (Bee Bear, I'm So Cute, Lion Cub, Girl Teddie with Birdie & Heart Balloon, Ladybug Teddy "My Little Lady", Rose), Large Quilted Bibs (Baby Teddy Catching Butterflies, Baby Teddy with Balloons, Baby Birdhouse, Babies Are Angels), Gingham Alphabet, Prefinished Baby Items (Pink/ Blue Bubble Letter Alphabet, Polka Dot Bubble Letter Alphabet, "Ashley" Bib, Hug Me Bib with Teddy and Heart Balloon, Oh Soo Cute Burp Towel & Bib, Babies are Angels Afghan Lion Cub Wash Mitt, Baby Terrycloth Towel); BABY Framed, Baby Tote with Rainbow Border, Baby Alphabet and Animals (Alphabet, Lion Cub, Stuffed Toy Giraffe Baby Elephant, Baby Teddies for Alphabet Letters, Extra Balloons - Stars - Hearts), Baby Sipper Cups (Baby Elephant, Large Train with Star Balloon, Birl Teddy Sitting with Heart Balloon, Baby Teddy Crawling on Cloud, Giraffe with Heart Balloon), Baby Afghan, Kitten - Puppy - Lamb, Baby Teddy Angel Bear, My Blankie Afghan, Variegated Alphabets, Let Me Tell You About the Bears & the Bees. Slightly bent bottom cornes from mailing, but otherwise like new. Baby Designs for Waste Canvas, designed by Sam Hawkins, American School of Needlework, 1990. Designs incldue: Sweetheart Bouquet, My Heart Belongs to Daddy, Polka Dot Giraffe, Snuggle Bunny, Rock A Baby Buggy, Grandmother Goose, Doodletown Ducks, Bouncing Booties, Clowntown, Teddy's Treasures, Ring- Around- The- Rosie, Mr. Roly Poly, Just Truckin' Along, Wanna Play, Little Tax Exemption, Just a Little Snooze Please, Puppy Love. Price crossed off on cover, but otherwise excellent condition. 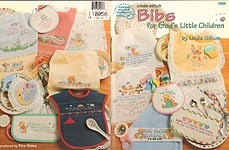 Cross Stitch Bibs for God's Little Children, designed by Linda Gillum, American School of Needlework, 1996. Designs incldue: For EveryCup, I See the Moon, The Lord Bless Thee, God Bless Babies, The Lord Will Provide, Oh God Make Us Children, Jesus Loves Me, Lord With Our Daily Bread, Thank You God For, God is Love, The Earth is Full, Dear God Be Good To Me, God Made the World, Give Thanks to God, Dear Father Hear and Bless, Give Us This Day. Price tag on cover, but otherwise like new. 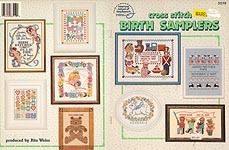 Cross Stitch 101 Itty Bitty Baby Designs, designed by Linda Gillum, American School of Needlework, 1997. Price tag on cover, but otherwise like new. 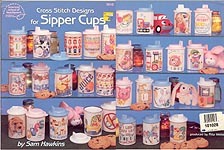 Cross-Stitch Designs for Sipper Cups, designed by Sam Hawkins, American School of Needlework, 1993. 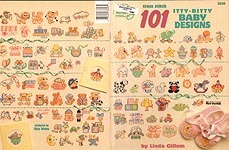 30 designs plus complete alphabet: Jack in the Box, Pink Elephant, Polka Dot Giraffe, Rocking Horse, Crazy Cow, Bunny, Great Kid, Duckie, Cookies and Milk, Grandmas Love, Little Miss Muffet, Teddy Love Me, Clown, Four Bears, I Look Just Like My Mommy, Carousel, Purple Cow, Juice, Toy Soldiers, Please Be Patient, Ice Cream Cones and More, No Pacifer, Giddy Up, Train, Oops!, Happiness Is, Puppy, Blocks, One Two Three, Loader. Very good condition. 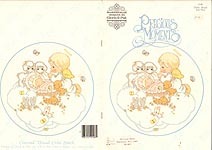 Precious Moments Baby Book (PM-8), designs by Gloria & Pat, 1985. Graphs includ: Family Tree (with alphabet), Our Praise to God, Birth Announcement, Baby's Arrival, Family, Growth Chart. Store label on front cover, general overall wear, size note in pencil on one page. Precious Moments Baby Vol. 2 (PM-29), designs by Gloria & Pat, 1996. Graphs include: Bundle of Joy (Girl and Boy), What's My Weight, Strolling, Baby's Favorite Things, Pretty as a Picture, New Arrival (Girl with Kitten, Boy with Puppy), Shower of Blessings, Baby's First Baby Food, Birth Sampler, Baby's First Word, Precious Keepsakes (Boy & Girl), Look At the Birdie, Hearts, Bows, Baby's First Birthday, Sending His Love, Baby Shower, Baby's First Steps, Baby Sleeping, Bath Time, First Place, Early Travels. Cover wear, some bent pages, notes on color charts of a couple of designs. Good used. 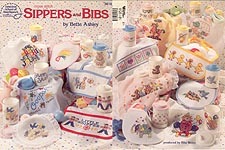 Sippers and Bibs, designed by Bette Ashley, American School of Needlework, 1993. Designs include: Carousel, Bluebirds of Happiness, Bear Babies, Alphabetrics, Dancing Duckies, Toytime, Bunny Bolckade, Crawlin' Around, Oops!, Heart of a Rainbow, EpheHump, Precious Baby, Clown Around Town, and Little Skipper. Excellent condition. 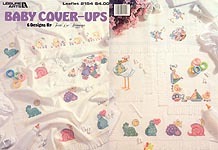 Baby Cover-Ups, designed by Terrie Lee Steinmeyer, Leisure Arts, 1991. Designs include Bluebirds, Chicks, Clown, Dinosaurs, Story, and Toys. Very good condition. 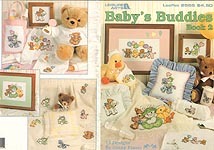 Baby's Buddies, designed by Ginny Fraser, Leisure Arts, 1982. Graphs include: Quiet Time, Animal Parade, Bear, Bunny, Duck, Elephant, Giraffe, Lamb, Playtime, and Party Time. Finishing instructions for Afghan, Tote Bag, Pillow , and Jar Lid. Very good condition. 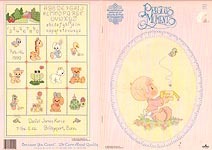 Baby's Buddies, Book 2, designed by Ginny Fraser, Leisure Arts, 1984. Graphs include: Tiger, Giraffe, and Bear; Bunny with Bear; Bunny; Giraffe, Pony; Bear on Lamb; Bunny on Pony; Duck; Tiger; Bear; Baby's Buddies; Bear, Bunny, and Duck. 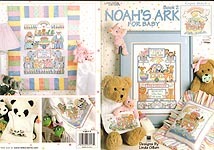 Excellent condition..
Noah's Ark for Babies, Book 2, designed by Linda Gillum, Leisure Arts, 1998. Graphs include: Raccoon Babies, Hippo Babies, Bearsand Bunnies, Two By Two sampler, A Gift From God birth announcement, 3 upper case alphabets, numbers, Soap 10 cents, Bath 5 cents, Panda Babies, Noha and Moose Babies, Tiger and Dolphin Babies, Lamb and Zebra Babies, Noah's Ark pillow, Afghan, ALphabet with Animals, Baby Animals. Price tag on cover; otherwise very good condition. 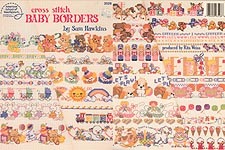 Cross Stitch Baby Borders, designed by Sam Hawkins, American School of Needlework, 1989. 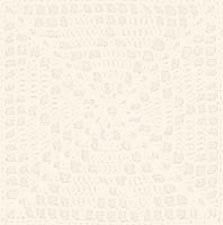 33 borders, from clowns and bears to ice cream cones, carousel horses, puppies, and more. Like new. 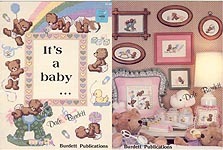 It's A Baby, designed by Dale Burdett, Burdett Publications, 1984. 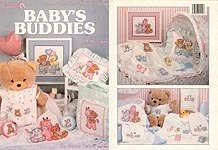 Designs include: Teddy Climbing on Goose, Teddy Riding Goose, Teddy and Bunny With Flowers, Teddy Hugging Goose, Teddies' Playtime, Teddy's Toy Box, Birth Sampler, New Kid On the Block, Babies Are For Hugging, Teddy's Special Friends, Nap Time, Alphabet, Teddy Pyramid, Can We Talk?, Teddy With Rocking Horse, Gimme a Kiss, Bath Time, Teddy Feeding Goose. Mark on one page as if someone were trying to get a pen to write -- otherwise, very good condition.